The Township of Fenelon is located in the second northerly tier of townships which compose Victoria County, lying immediately to the north of Ops, west of Verulam, south of Bexley and a portion of Somerville, and east of Eldon. It includes, conjointly with the corporate village of Fenelon Falls, an area of 69,120 acres, of which, as per the latest census, 21,810 acres were cleared and under cultivation. The general features of Fenelon's topography are moderate, though in some localities the extremes of hill and swamp are noticeable. The character of the soil is generally good, that in the southeast being the best grade for agricultural purposes; while the entire southern half of the township is a very good average. Toward the northern boundary, however, the surface is more broken, abounding in quite sharp elevations and low depressions, and forming a kind of introduction to the region of hills and lakes further north. Several streams of considerable size traverse the township in different localities , their general course being toward the limpid chain formed by Cameron and Sturgeon Lakes and Fenelon River, which stretch across the township from approximately the north-east to the south-west, while the eastern arm of Sturgeon Lake extends across into Verulam, slightly south of the centre of the township. Cameron Lake is a sheet of several hundred acres, in the north-easterly corner of Fenelon, drained by the Fenelon River, which connects it with Sturgeon Lake, about a mile distant. A short distance above its debouchement into the last named body, the waters of this river make a precipitous leap over the picturesque FENELON FALLS. This cataract is about twenty feet in height, and eighty in width, and to the lover of beautiful in nature represents a most attractive aspect. Though much less stupendous and grandly magnificent than other falls within the acquaintance of Canadians, this splendid display of nature's caprice in the topographical formation of the earth is not without its fascinating and awe-inspiring influences. Stern winter had locked the streams and floored the lakes when the writer of this sketch visited the Falls, and the frost-king had arrayed the scene in all the embellishments of icy splendour. The immense clusters of icicles which hung suspended from every available grappling place, sparkling in the radiance of the winter sunshine, clothed the scene in a garb of glistening grandeur, the effect of which was heightened by the contrast to the sombre hued and swiftly rushing waters, fresh from their leap over the rocky shelf, presented by the immaculate purity of the hoar frost covering all objects in the immediate vicinity, and crowning to the height of several inches the buoyant extremity of a partially submerged piece of timber, which gently swayed upward and downward with the motion of the fierce current. The excellent water power here afforded was early utilized for the propulsion of mills, around which gathered a hamlet, whose proportions gradually extended into those of a village, and has continued the process of development until it has now become the most important trade centre north of Lindsay. About the year 1841 Lord Montcastle, who owned the site of the present Village of Fenelon Falls, exchanged that property for a tract on Boyce's Bay, on Cameron Lake, the exchange being made with Messrs. Wallis and Jamieson, who immediately commenced the construction of the first mill in the township. The mill referred to was for gristing only, being fitted with stones brought from Toronto on sleighs, and standing on the left bank of the river, immediately below where the bridge now stands. There was then near the bank of Cameron Lake, within the limits of the present village, an Episcopalian parsonage, the residence of the Rev. Mr. Fidler, incumbent of the Anglican church, which then, as now, overlooked the cataract from the contiguous cliff. This gentleman is reported to have been subsequently drowned by being carried over tge falls, in company with another gentleman, in a canoe, but before the construction of a dam across the stream. In 1851 Messrs. Wallis and Jamieson demolished the original mill building, and erected in its stead separate grist and saw mills on the left bank, below the bridge. In the meantime Mr.Wallis, (whose Christian name was James) had opened a store, in a small building behind the post-office, and Mr.Jamieson had built a residence in the rear of the McArthur House. The more extended building and milling operations then set on foot by the firm named created a demand for mechanics and labourers, among the first of whom to take up residence here was Jeremiah Twomey, who came to do blacksmithing in connection with the new milling project, and having ever since resided here, he was in 1881, one of the oldest citizens and most extensive property owners in the village. As early as 1850, one Comstock opened the first hotel in Fenelon Falls. It was of logs, and stood almost exactly on the site now occupied by the McArthur House. Mr. Comstock is reported as having been a model host, of wide popularity among sportsmen and tourists, whom he used to equip with the implements for securing the game with which the adjacent forests and lakes abounded. The site of the village was still covered with forest, with the exceptions indicated, as late as the building of the second mill in 1851, the only semblance of a road being a track cut along the main street of this date, sufficient to admit of the passage of ordinary unloaded vehicles. The chief avenue of the present was soon thereafter cut out, however, by Mr.Wallis, who laid a foundation of slabs from his mill, which he covered with gravel, and to demonstrate his further interest in the improvement of this highway, it is said, he carried two stone sledges of different sizes, with which he was wont to break the stones on this street in passing to and fro beween his mill and residence, the latter being located on the shore of Cameron Lake. The increased activity incident to the completion of the mills soon attracted a number of tradesmen, mechanics, and others, and what had so recently been a forest began to loom up a village. The first of those to engage in mercantile trade was James Fitzgerald, who opened a store in a building on Main Street. The proprietors had the building on the left bank of the river (where the chief portion of the village is located) surveyed and plotted into village lots in time to meet the increased demand occasioned by the influx of settlers, and the growth of the village was steady and satisfactory until the destruction of the mill by fire about eight years after its completion, whereupon a reaction took place, and the progress of the village was suspended for a considerable period. Very soon after the building of the mill referred to, Mr.Wallis built a boat to convey his lumber to Port Perry, whence it was 'teamed' to Port Whitby. After the launching of this craft, which was called the Ogemah, and commanded by Capt. John Allbrook, there is said to have congregated the greatest crowd of people ever seen in Fenelon Falls, and the event was celebrated by a free banquet, spread, at Mr. Wallis' expense, in the workshop on the river bank. After the destruction of the mill, the property along the left bank of the river fell into the hands of Sutherland Stayner, in whose possession it lay idle for a considerable time, when R.C. Smith of Port Hope, and - Waddell, of Cobourg, rented and built a new mill upon it. Before the expiration of the lease, Mr.Smith acquired the property by purchase, and remained its owner through the 1880's, as well as the opposite side of the stream, where stood an extensive saw mill. The revival which followed the completion of the Smith mill soon brought the village into commercial prominence, and elevated it to a plane of great lumbering importance. In 1875 the village entered upon an independent municipal existence, under the control of the following named Council: J.D. Smith, Reeve; J.W. Fitzgerald, Joseph McCarthur, William Jordan, and Richard Jackson, Councillors. 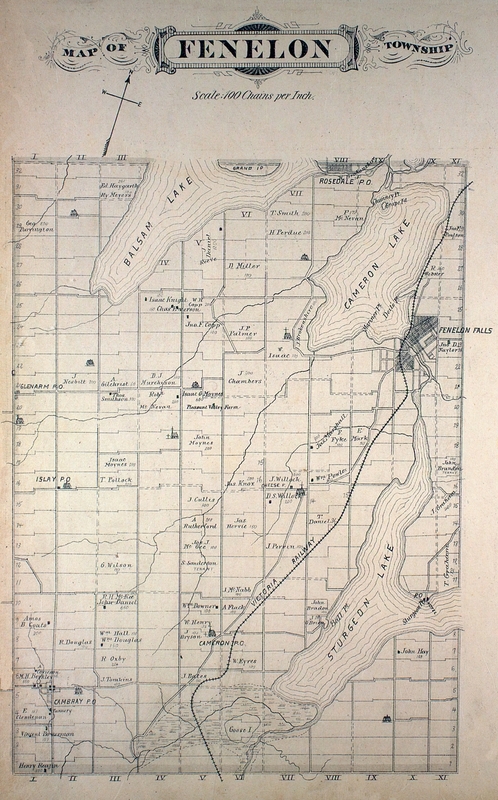 The considerable manufacturing interests of Fenelon Falls are confined to milling, in grain and lumber, the latter branch of trade being the most extensive, and employing several sawmills of very large capacity. It is well supplied with hotels, the chief of which is the Mansion House. The Fenelon Falls Gazette supplies the journalistic advantages of the vicinity. It was a good local paper of Liberal proclivities, established in 1873 by E.D. Hand. A station on the Victoria railway affords shipping facilities to the frontier via Lindsay, as well as to the lumber limits of the northeast. There have been settlements formed in the Township of Fenelon Falls prior to the location at the Falls of the pioneers of that village. About two miles from the village, on the shore of Sturgeon lake, John Langton settled about 1845. He was subsequently prominent in political affairs, was elected to Parliament, and afterwards appointed Auditor-General of the Province. The land in the vicinity of Cameron Lake, had been granted to John Cameron, a Toronto banker, a political supporter of the powers that were in those days. In that locality the pioneers were an Englishman named Bellsford; John McIntyre; the present Judge Denniston, of Peterborough, who located at the 'Chimneys,' on the west shore of the lake; Hamilton and Samuel Boyce, from whom Boyce's Bay took its name; and James Humphrey. Along the shores of Sturgeon Lake, north arm, Jas. Cook, John D. Naylor, Wm. Jordan, and _ Powers, deserve mention among the early residents. About the centre of the township was formed what was known as the "Scotch" settlement, where Isaac and Thomas Moynes, Robert and Archibald McNevins, Wm. Selby, the Murchisons and Browns settled, with others, during the early history of the township.